Motorcycle Sunday is a FREE annual one-day motorcycle rally. 2019 is the 19th anniversary of MCS - and it's gonna be awesome - especially if YOU are there. Motorcycle Sunday has become a yearly destination for many motorcycle enthusiasts from all over the mid-west. Motorcycle Sunday is a motorcycle rally, bike blessing, live concert, 60 mile ride - and more! There are bike shops, dealers, & vendors, food vendors, people's choice bike contest, pro bikes photos available. And great rock and blues bands all day. 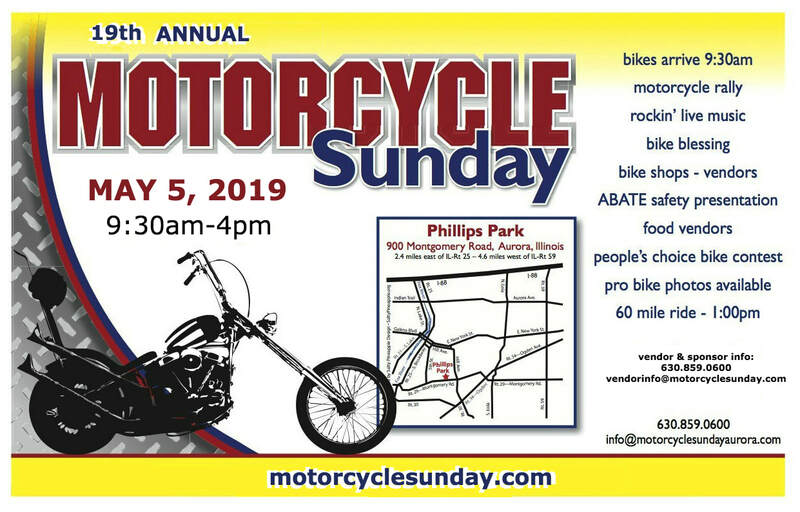 Motorcycle Sunday is held at Phillips Park, 900 Montgomery Rd. in Aurora, IL. This is a family-friendly event. Admission is FREE! All types of bikes and riders are welcome.